Agriculture Secretary Tom Vilsack on Thursday will announce a batch of regulatory reforms designed to deliver services to farmers and ranchers "in a streamlined way" without sacrificing quality in his department's work. On the eve of a speech to the National Association of Farm Broadcasters in Kansas City, Mo., Vilsack spoke to Government Executive about his role as a manager responding to President Obama's April executive order tasking federal agencies with making regulations more efficient. The specific reforms Vilsack will unveil are aimed at speeding rural disaster assistance, expediting reviews of pending product applications and simplifying crop acreage reporting dates. 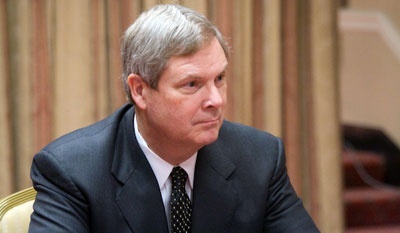 "It's important that we constantly look at process improvement at USDA or any government agency," Vilsack said. "So I had challenged our mission areas to focus on more quickly delivering services in a streamlined way. It's kind of wonkish and detail-oriented, but at the end of the day, time is money" for farmers and agricultural businesses, he said. These changes will "allow companies greater predictability on when their products get to market." In particular, Vilsack praised the Animal and Plant Health Inspection Service for shortening its process for license applications for veterinary biologics -- substances used to treat animals -- by as many as 100 days. APHIS also has trimmed the average length of the petition process for companies seeking to have their genetically engineered organisms delisted from regulatory monitoring. And it is cutting the enforcement process from 215 days to 165 against parties who jeopardize plant and animal health or welfare. The Farm Service Agency is hoping to reduce the time it takes farmers and ranchers hit by natural disasters to receive a secretarial disaster designation, which allows them to receive loans and other assistance, by cutting the process from six steps to two. Visack said he met last week with disaster victims in Illinois who were "impressed" with the department's two-week turnaround. "When you've been devastated by a natural disaster, the last thing you want is an excuse that these things take time," he said. FSA also is permitting producers to apply to its Conservation Reserve Program with a single visit to an agency office. And it is working with Agriculture's Risk Management Agency to share data to reduce what had been 71 acreage reporting dates for hundreds of crops to 15 common dates. Vilsack said the streamlining plans got rolling when one of the department's mission area managers showed him a design schematic of the current process for reviewing genetically engineered crops to respond to a company's assertion that its experimental farm product has been proved safe. "It was a decision tree with many steps, so I asked if all the steps were necessary, because it was hard to pin down who actually was making each decision," he said. It turned out some of the decisions could be made simultaneously, and now "the shorter time frame will allow a company to get it into the stream of commerce more quickly." Asked why such streamlining hadn't been accomplished a long time ago, Vilsack said, "You'd have to ask the guys who had my office and job before. I came in as a former governor. USDA historically was set up with the secretary as the spokesman, but management was done at the department level. I'm heavily engaged in management. And the reason is, we're facing historically challenging times in the budget." The reforms being announced Thursday follow another set of changes implemented in October, when the National Agriculture Statistics Service said it was eliminating dozens of reports on the population of farm animals and inventoried produce. The department, which is preparing to celebrate its 150th anniversary, said in a statement that U.S. agriculture is "currently experiencing one of its best years in decades thanks to the productivity, resiliency and resourcefulness of our producers." Vilsack said he wants to "send a message to our customers that we're trying to improve services without sacrificing quality."